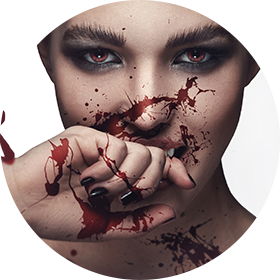 The “Vampire Facial” utilizes your own platelets as a cosmetic skin care treatment. Platelets are a component of the blood that is rich in growth factors. The growth factors include platelet derived growth factor (PDGF), transforming growth factor (TGF)-β, vascular endothelial growth factor (VEGF), epidermal growth factor (EGF), and insulin growth factor (IGF). When re-injected in high concentrations in the dermis, these growth factors can stimulate the production of collagen, elastin, and hyaluronic acid, which when in the right balance, lead to healthy and youthful appearing skin. Blood is collected from a small puncture in a vein, usually in the arm. The blood sample is then treated in a process called centrifugation. This separates the components of blood into three layers, a layer rich in red blood cells, normal plasma, and platelet rich plasma (PRP). The PRP segment is then extracted. This serum is then infused back into the face using the Eclipse MicroPen® microneedling device that penetrates the skin driving the activated platelets and growth factors into the dermal layer. The growth factors then stimulate endogenous collagen production by promoting fibroblast growth and activity. It can also increases oxygen and nutrient delivery by increasing blood vessel development (angiogenesis). This question is best answered with an in-person consultation as all skin types and skin conditions are different. However, there is evidence to support this treatment being beneficial for reducing acne scars, stretch marks, and reduces the reappearance of fine lines and wrinkles.